What is the Zero Waste Certification? All over the world companies and organizations are claiming Zero Waste but very few are able to have their claims stand-up to international scrutiny of the environmental community. 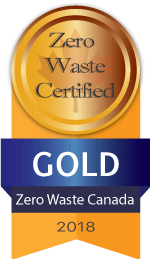 To be recognized or certified as a Zero Waste Facility by Zero Waste Canada is to show your customers and employees that your facility has achieved the highest level of recognition in the world as it relates to materials discard management. Not only will this promote your business as an environmental leader in managing your discards, it will also provide you with a superior understanding of what you are throwing out, how this is currently effecting the environment, and provide you with cost effective alternatives to handling your discards. Why become Zero Waste Certified? Environmental Performance – Achieving internationally recognized standards for Zero Waste. Economic Performance – Uncovering opportunities for avoided costs via product re-use policies, material substitution/elimination, reduced waste hauling fees and purchasing expenses. Impact Measurement – Achieving a superior understanding of the financial, environmental and social impact of your discards generation via the establishment of an internal system of metrics and feedback, through which the cost of inaction towards waste reduction is documented. Culture – Redefining the role and value of staff members as educators when communicating with colleagues, suppliers, investors, partners and patrons alike. Brand Equity – Authorization to feature Zero Waste Canada’s official “On The Road To Zero Waste” Business Badge, and ultimately, its “Zero Waste Certified” Business Badge across internal and external communicational channels, so as to formally associate your facility with the highest standard of environmental performance in discards management. Credibility – Zero Waste Certification offers factual evidence of your facility’s social and environmental accountability, as adopting a Zero Waste policy entails addressing this issue and its broad implications systemically. Patron Experience – A unique relationship with your patrons unrivalled within your sector, where an experience and a lifestyle in alignment with your mission, values and vision, are offered in addition to your service, offering the opportunity to develop your user base and marketing potential towards new additional community segments/profiles. Online – Listed on Zero Waste Canada’s official website as having met the (publicly available) requirements for “On The Road To Zero Waste”, and ultimately, for “Zero Waste Certification”. Nationally – Name and website link featured across Zero Waste Canada’s multiple channels of communication with its community, members and the general public alike (including website, social media, newsletters, educational material, media appearances, nation-wide chapter meetings, public and private presentations and outreach) as an example of a Zero Waste facility. Internationally – Name and website link featured within the global pool of “Zero Waste Certified” facilities across the Zero Waste International Alliance’s (ZWIA) website and wider network of Zero Waste professionals, national affiliates and followers/supporters/visitors. Media – Dedicated press release on behalf of Zero Waste Canada upon achievement of “Zero Waste Certification”. Business Community – Referenced as an example of leadership and good practice in meetings, conferences and proposals involving other facilities, policymakers and industry professionals. Membership – One year Zero Waste Canada Business Membership. Definition & Hierarchy: Publicly reference the Zero Waste Definition & Zero Waste Hierarchy by devoting a space to both within your facility and on your website. Zero Waste Canada Application: Submit a formal application to Zero Waste Canada signaLling your intent to embark upon the Road to Zero Waste. The application will include the Zero Waste Canada Application Fee. Initial Facility Assessment & Composition Study: Summon a Zero Waste Associate to perform a Facility Assessment and Discard Composition Study on-site. This will serve the purposes of evaluating the current standing of your facility in order to inform targeted action, as well as to offer a baseline of information from which your progress will be measured. Initial Tracking: Subsequent to a Facility Assessment and Discard Composition Study, a 3-month tracking period of your discard performance will be conducted. Facilities are in turn required to declare their current cost of disposal at the time your application is submitted. Source Separation Of Material Streams: Provide evidence of separate categories of separation for all material streams (including any hazardous waste) at all on-site points of generation/collection, with their corresponding signage. No distinct material discards are mixed together in the same collection bin. Responsible Management Of Hazardous Waste: Ensure that any hazardous discards generated are appropriately utilized, stored and disposed of so that no hazardous substances enter your local environment (via water, air, soil or otherwise) in complete compliance with federal, provincial, and regional/municipal laws. Remaining Up To Date: In the event of any requests on behalf of Zero Waste Canada, internal policies and adopted Zero Waste language will be modified to reflect any revisions which may take place on behalf of the Zero Waste International Alliance (ZWIA). Following the achievement of “On The Road To Zero Waste” recognition, the process towards “ZERO WASTE CERTIFICATION” may begin. Zero Waste Certification is comprised of three distinct levels of performance: SILVER, GOLD and PLATINUM. A SILVER LEVEL performance represents the base level of certification, certifying that you have achieved a level of performance within your facility that may be recognized as Zero Waste. You have successfully enacted Zero Waste policies at every organizational level. A GOLD LEVEL performance certifies that you have maintained and gone beyond the base level requirements of SILVER LEVEL ZERO WASTE CERTIFICATION by pursuing Zero Waste practices not solely among all internal organizational levels, but also within the wider sphere of influence in which your facility operates (this may involve other organizational branches, partners, suppliers, patrons or other entities interacting directly with your facility and its operations, but who remain external to the facility itself). 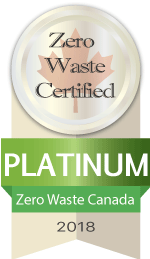 A PLATINUM LEVEL performance certifies how you as a facility have maintained and gone beyond both the base level requirements of SILVER LEVEL ZERO WASTE CERTIFICATION and the wider implications of GOLD LEVEL ZERO WASTE CERTIFICATION by pursuing the furthering of Zero Waste practices and principles beyond your own facility and its direct operational influence. Your facility has achieved this by directly engaging your wider community, which may or may not interact directly with you as a facility. A PLATINUM LEVEL performance certifies a genuine commitment towards Zero Waste from a larger societal perspective, where you as a facility advocate for larger systemic change for waste reduction and offer a living example of how Zero Waste is ultimately about much more than just waste. *These fees are to cover all associated administrative costs for Zero Waste Canada as we review submitted documentation from facilities and assess eligibility for Zero Waste recognition or certification. A ZWA represents an external third party agent working directly with facilities for them to achieve a Zero Waste level of performance. Fees will vary depending on the ZWA and facility in question. To remain impartial in judgment, Zero Waste Canada does not work directly with facilities as they work towards a Zero Waste level of performance. Zero Waste Canada evaluates the work performed by a facility with their respective ZWA to determine eligibility for Zero Waste recognition or certification. Fees from external ZWA’s are not regulated by Zero Waste Canada. These will be reliant on the size and status of each individual facility at the time they decide to embark upon the road to Zero Waste and will thus vary from facility to facility. Once a ZWA and a facility believe they have achieved a Zero Waste level of performance as outlined by Zero Waste Canada, a Zero Waste Verifier must through Zero Waste Canada conduct an independent third party evaluation of the facility in question prior to it being awarded “Zero Waste Certification” status. Zero Waste Canada’s Verification Fee is included in the annual renewal fee, unless facilities are moving up to the next level of certification. Under this circumstance a Zero Waste Verifier (ZWV) will need to return to your facility to make an assessment before a facility may advance to the next level of certification. Need Help? Hire a Zero Waste Associate! A facility working towards achieving “On The Road To Zero Waste” and ultimately “Zero Waste Certification” status, may summon a Zero Waste Associate to guide them along the process of certification. What is a Zero Waste Associate (ZWA)? Manages the application process with Zero Waste Canada for facilities to achieve “On The Road To Zero Waste” recognition. Including a review of documentation and ensuring that materials are submitted according to the outlined specifications of Zero Waste Canada. 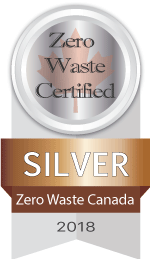 Manages the application process with Zero Waste Canada for facilities to achieve “Zero Waste Certification” status. Including a review of documentation and ensuring that materials are submitted according to the outlined specifications of Zero Waste Canada. Performs the required assessments for facilities to achieve both “On The Road To Zero Waste” recognition and “Zero Waste Certification” status (such as for example a “Facility Assessment” or “Discard Composition Study”). We love helping you succeed. Feel free to reach out and discuss your questions with one of our certification experts/consultants. Learn about our Zero Waste Certification Program and get started on your way to Zero Waste. Sign up for our email newsletter to receive information from Zero Waste Canada. © 2019 Zero Waste Canada All rights reserved.